â€¦powder puffs! Powder puffs are a great background for all types of fun enhancements. and comes in a lot of fun colors and patterns. 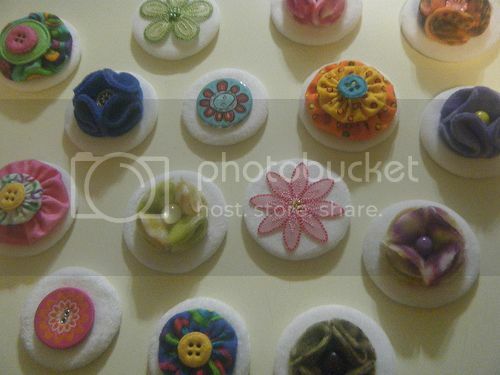 To begin, cut 4 circles from the fleece and a smaller circle of felt that youâ€™ll glue your petals on to. cut for the petals, so itâ€™s a great flower to make when you need a â€œjust the right sizeâ€ bloom. few stitches at the point. You can also secure the petal with glue, if you prefer. Do this to all 4 circles. â€¦ with the points of the petals meeting in the middle. Add a center. I used a silver button. Now that you have your embellishments on the powder puffs, add a simple hanger. special message on the satin portion of the powder puff. Thatâ€™s it. Super easy, super cute, super quick. and fabric from Jo-Ann Fabric & Craft, and I used Fabri-Tac glue to adhere all my elements. Thank you again, Missy, for inviting me to guest post, and I wish you all Happy Holidays. Genius! And inexpensive! My kind of project for sure! I love the last one the best! So sweet!